Calendar links are an easy and controllable way to give individuals or groups customized access to your Teamup calendar. Think of your master calendar as an office building. You own it and control access to it. To let a tenant use your offices, you give them a key. You can give a key that opens one office, or several offices, or all of the offices in the building. And, if needed, you can change the lock so the key no longer works. Each key also comes with a set of permissions. 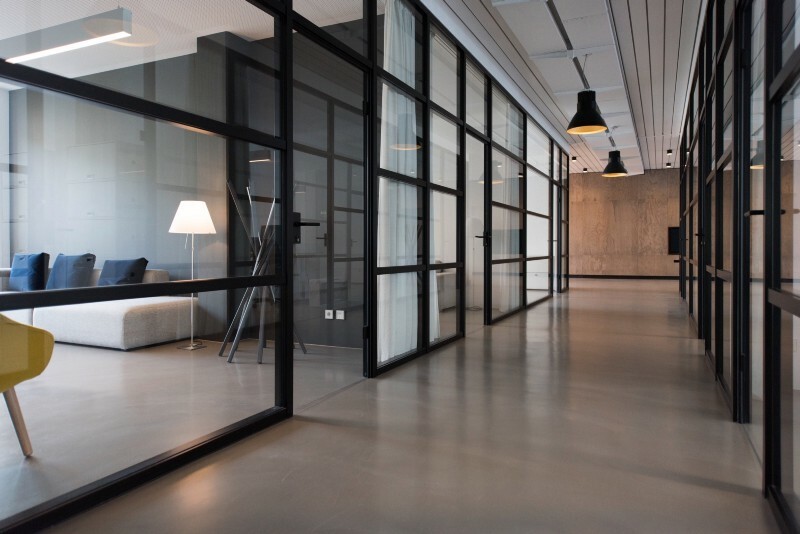 One key might allow a tenant to enter multiple offices, just to look around. Another key might allow a whole group to come in and rearrange things to suit what they’re doing. A calendar link works the same way. 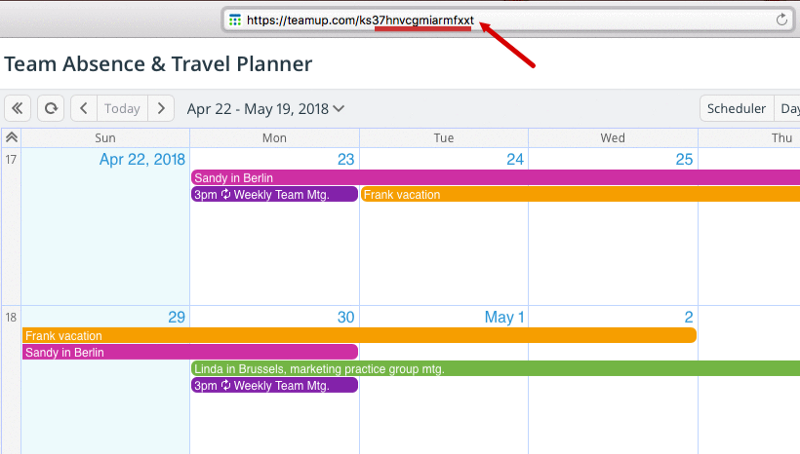 You can create customized links that allow access to your calendar. Each link opens a customized view to the selected sub-calendars (offices) you’ve included. 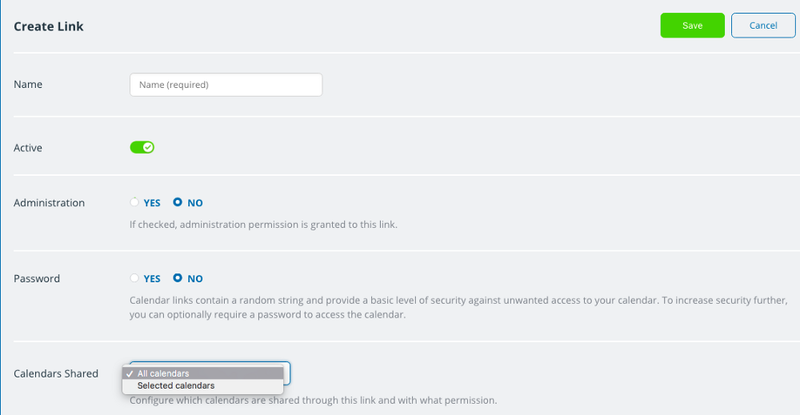 And you set permissions for what people can do with each sub-calendar: read only, add items, or modify all? It’s up to you. There are 9 permission levels you can choose from. 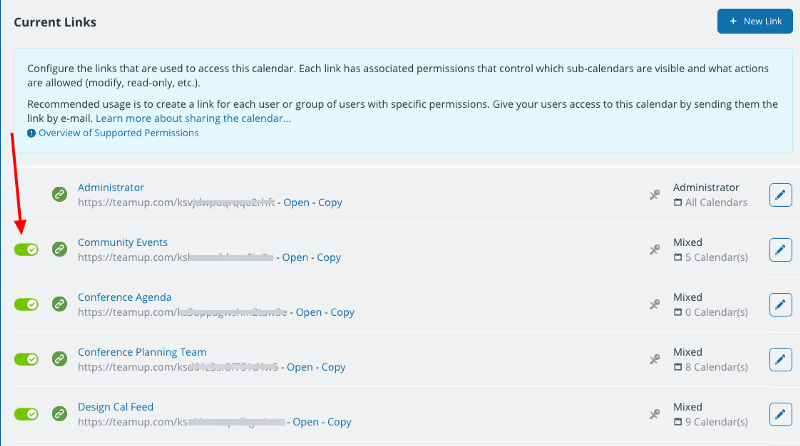 When you create a Teamup calendar, you receive the administrator link (it is displayed on the screen and sent to the administrator email). There are also several pre-configured calendar links in Settings > Sharing. You can use the pre-configured links as they are, modify them, or you can create new links for calendar access. For each calendar link, you choose which sub-calendars to include. Then you set permissions for each sub-calendar you’re including. When you create such a link, a unique calendar key is generated, and that becomes part of the calendar link. The calendar key is the code at the end of the calendar link. Someone using one of these keys will only have access to the sub-calendars and permissions you set for that particular link. To create a new link, you need to go to the Settings from an administrator link, go to the Sharing tab, then click the New Link button at the top right. To create a new link, go to Settings > Sharing. Choose the basic options for your new calendar link. Name: use something that will help you remember who is using the link. Active: you can toggle the calendar link on and off. Administration: be careful with this option and only check Yes if you want the link to include full administrative powers. Password: you can include a password for an added layer of security (available on paid plans). You might have a calendar with forty different sub-calendars; if you create a link that includes only one and share it with someone, they’ll only have access to the one sub-calendar you included. You can choose to include all sub-calendars or select the calendars you want to include. If you include all sub-calendars, you can set permissions globally. You can set permissions globally if you include all calendars. A drop-down window allows you to easily set permissions for each sub-calendar. There are nine different levels of access permissions that you can assign to each of the sub-calendars for a sharable link. Administrator: Includes all permissions and is the only permission level allowing access to the Settings interface of the calendar. Include this permission with great care! Read-only: Can view calendar events, including details, but not make changes. Read-only, no details: Can view calendar with events marked as reserved time blocks, but no further event details included. Cannot make changes. Add-only: Can add new events; can read but not modify any existing events. Newly added events can be modified only during the current browser session (up to approximately 30 minutes). Add-only, no details: Same as Add-only but the details of any existing events are hidden (marked as reserved). Modify: Can add new events and modify or delete any existing events on the shared calendar. Modify-from-same-link: Can add new events and modify any existing events that are created via the same link, but can only read (not modify) any existing events created via other calendar links. Modify-from-same-link, no details: Can add new events and modify any existing events that are created via the same link, but the details of any events created by others will be hidden (marked as reserved). Not shared: the calendar is not included in the shareable link; it will not show in the list of sub-calendars on the sidebar. You can edit, deactivate, or delete calendar links at any time. You can deactivate a calendar link without deleting it. You can edit or delete a calendar link at any time. Calendar links are always under the control of the calendar administrator. If you need to grant temporary access to your calendar, you can do that. Simply deactivate or delete the calendar link when you no longer wish it to be used. Here’s more information about calendar links. If there are multiple users with the administrator rights, each of them has the same power of controlling the calendar links and all other settings. Be aware of the security implication of an administrator link. Read more about administrator links. Header image by Nastuh Abootalebi on Unsplash.